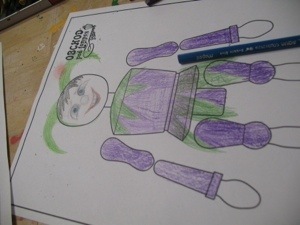 Our puppet making started with a sketch of the puppet we were going to make. 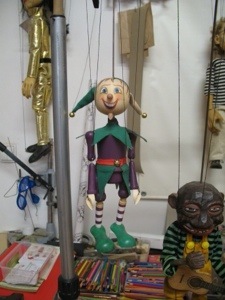 Miss Hannaford wanted to make Kaspar the Jester- the central character of Czech puppetry. 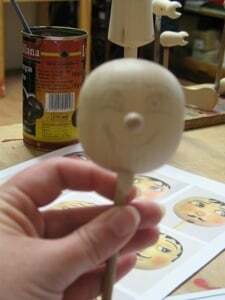 The next step was to draw the face of the character onto the wooden head and colour it in using watercolour pencils and regular colouring pencils. We decided to make Kaspar a friendly character who like to smile and be silly when it is appropriate. The next stage was to paint the body. 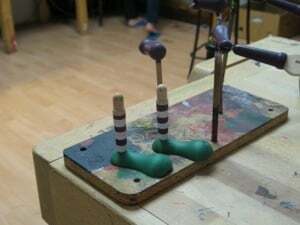 Pavel showed us how you can use a drill to help paint neat stripes around the legs to make it look like the puppet has stripy socks! The final step was to assemble the puppet, put his clothes and bells on and put strings from the hands and legs up to the control rods! He looks fanastic! 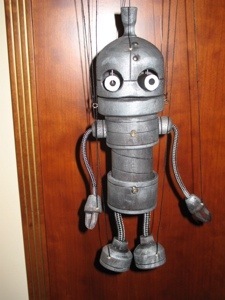 It took Miss Hannaford 3.5 hours to design, paint and assemble this puppet. After a short rest at our hotel, it was time to go back to the National Puppet theatre to see their long running, famous production of the Italian Opera Don Giovanni. The performance opens with the puppet of Mozart ‘walking’ up to the orchestra conductors position in the orchestra pit. 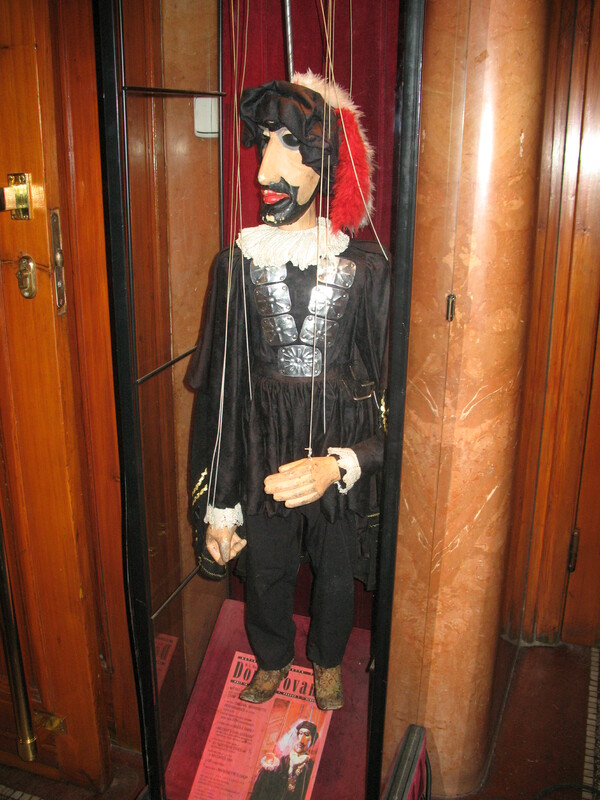 The difference between this puppet and all other Czech puppets is that it is operated from below using rods and levers. 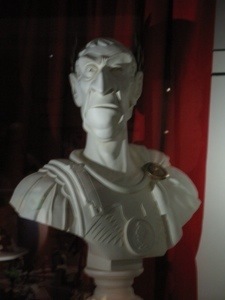 As we left the theatre we had the opportunity to see up close one of the older versions of the actual Don Giovanni character. 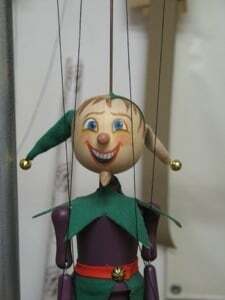 This version of the puppet is no longer used in the production because some of its joints had been repaired so many times that it was not possible to repair it any more. 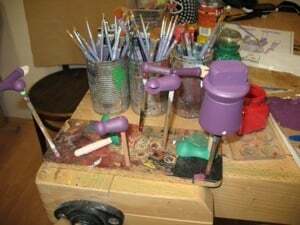 In puppetry, exact replica puppets are often made to replace puppets that are damaged beyond repair after many years of use. 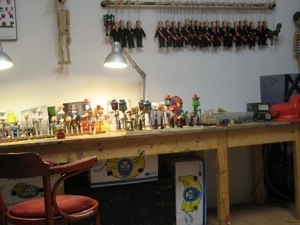 It was a really interesting and fun puppet day! 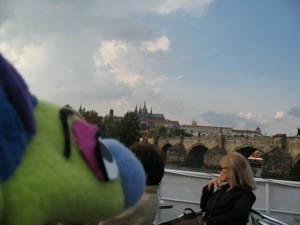 Today Miss Hannaford and I visited the National Puppet Theatre in Prague. 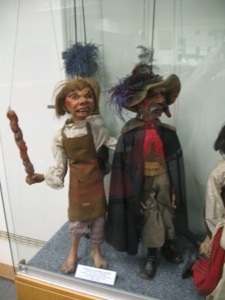 Czech puppetry is very different to other forms of puppetry around the world in that the puppet has a metal rod coming out of its head that connects to the control handle as well as strings to move the hands and feet. 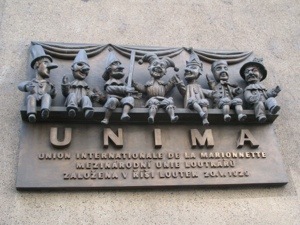 Miss Hannaford is a member of the International Puppetry association called UNIMA so we were given the rare opportunity to go under the stage at the National Puppet Theatre to see their collection of old puppets and puppet costumes. 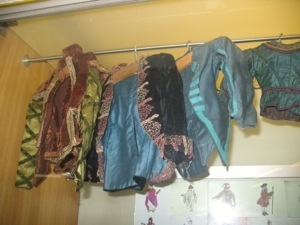 Some of the puppets are over 100 years old and some of the costumes are nearly 100 years old. 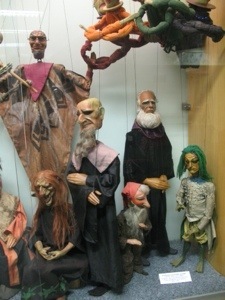 Miss Hannaford was allowed to photograph the very old puppets under the stage. All of the puppets have been hand carved out of wood including the faces but the carving has been made so smooth that you can’t tell that they have been carved. 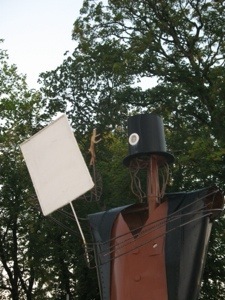 Because all the puppets are made of wood, they are very, very heavy. Miss Hannaford’s favourite part of the display was of all the puppet costumes. 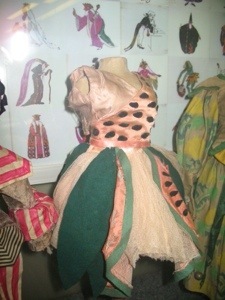 It gave her the opportunity to look closely at the amount of detail that goes into the costumes but also an opportunity to look at how the costumes look from the inside so she can design interesting costumes for her puppets. After we finished under the stage, we were invited to come back tomorrow and see their resident puppet show- Don Giovanni performed in the original Italian. We accepted their kind invitation! 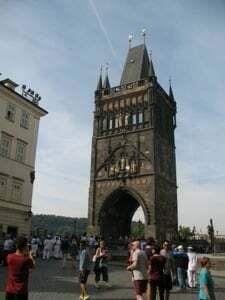 After visiting the theatre, we walked across the Charles Bridge- a very famous pedestrian only bridge. 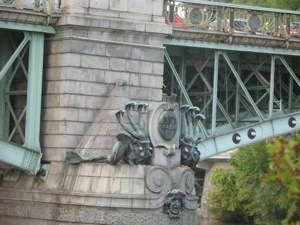 At each end of the bridge is a huge stone gateway and along the bridge are lots of bronze statues of famous religous figures. 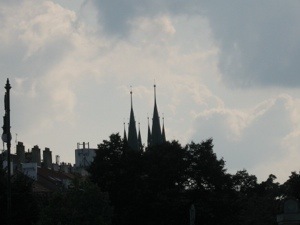 You can also get a really great view of Prague Castle up on the hill. 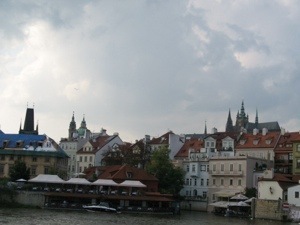 Hidden at the end of the bridge is a famous puppet shop called that Miss Hannaford had been told is the best place to buy puppets in Prague. It has lots of different characters but Miss Hannaford really liked the robots so she bought one! 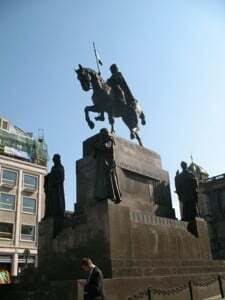 Our last stop for the day was to visit St Wenceslas Square and to see the statue of the Patron Saint of Czech Republic- St Wenceslas. 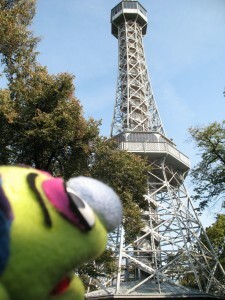 It has certainly been a very puppety day! 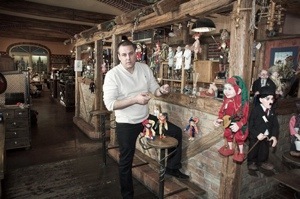 Today Miss Hannaford and I went to visit a puppet maker here in Prague. 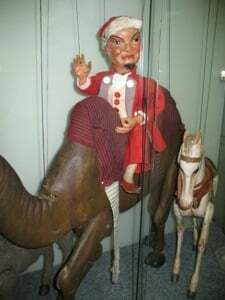 The Czech Republic has a long history of making wooden marionette (string) puppets and Miss Hannaford wanted to add a real Czech Marionette puppet to her collection. 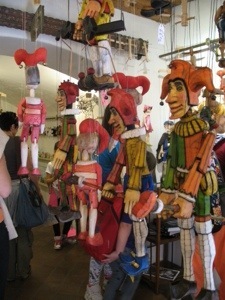 The shop we visited is called Rici Marionettes. 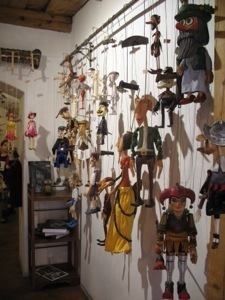 There are lots of different marionettes ranging from really small to really big. The really big puppets have mechanisms inside them that allow the eyes to move or for the mouth to open and close or a tongue poke out. 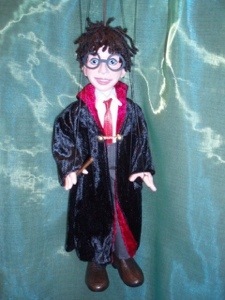 Miss Hannaford ended up purchasing a large warlock puppet with the eye and mouth mechanisms and a small Harry Potter Marionette! 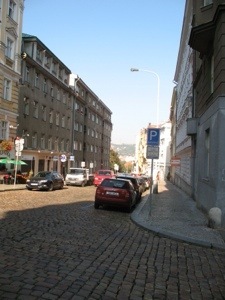 You can see here how steep the roads are in Prague. 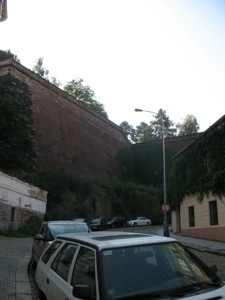 Miss Hannaford and I had to climb this hill to get to this puppet shop and when we got to the top we could see some of the old defensive wall that surrounds the town as well as great views across the city to the other hills! 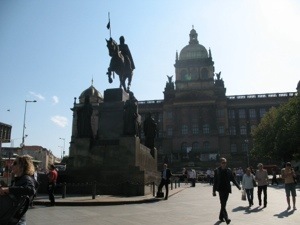 After our puppet shopping, we caught the tram back to the main square of Prague called Wenceslas Square named after Saint Wenceslas who is depicted in a huge statue at the top of the square. 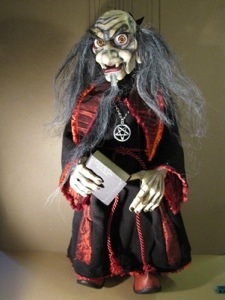 I am really looking forward to binging my new friends home although I think the Warlock is quite scary! Miss Hannaford was feeling better today so we decided to go on a series of bus tours around Prague. The first tour started at a really interesting building near our hotel. 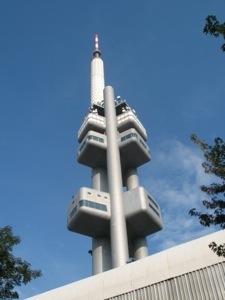 It is called Ziźkov TV tower. 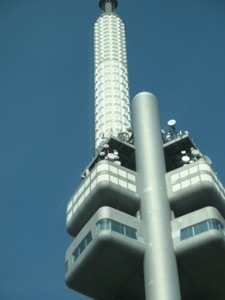 The building looks like it is a space age building- something you would find on an alien planet. 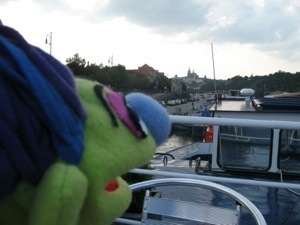 Part of the bus tour included a river cruise on Vltava River, the main river through Prague. 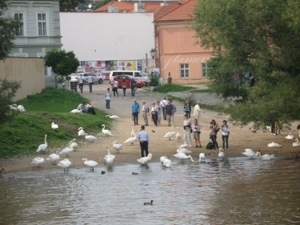 From the river we could see the big Hradčany Castle as well as all the decorated bridges across the river. 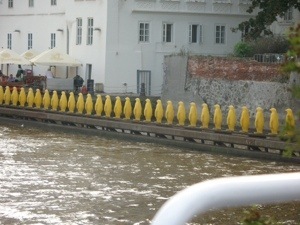 During the cruise, we spotted a row of yellow penguins marking the edge of a canal beside the river as you can see above but further down the river was a really big group of white swans at the edge of the river. They were really pretty! 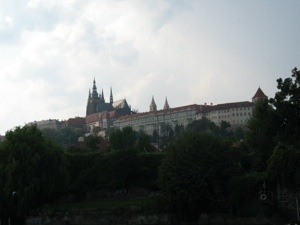 Here are some photos of the Hradčany Castle as seen from the river. 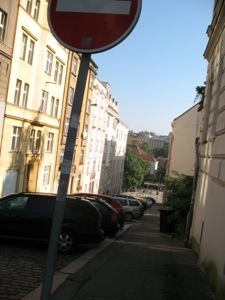 It was a very interesting tour around Prague! Today was another long travel day. We left our hotel in Brussels at 5:30am and took the local subway trains to the big Mid Brussels train station for our 2 hour train to Cologne in Germany. 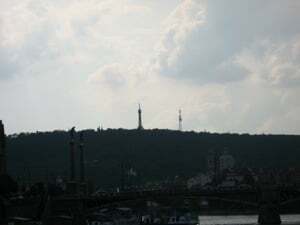 We then changed trains for a 4 and half hour train trip across Germany to Berlin, the capital city of Germany. In Berlin, we changed to our final train for this 3 month adventure for the 3 hour trip to Prague, the capital city of the Czech Republic and the last city we are visiting on this adventure! 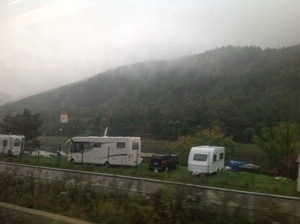 Here are pictures of the German and Czech countryside we travelled through. Miss Hannaford was very unwell today so we stayed in the hotel so she could rest. 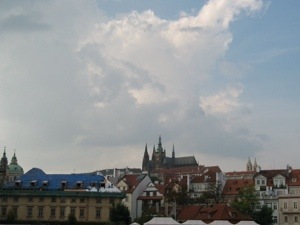 Hopefully tomorrow we can go an explore Prague. 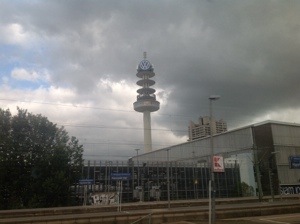 Today we travelled by train to Brussels, the capital city of Belgium. 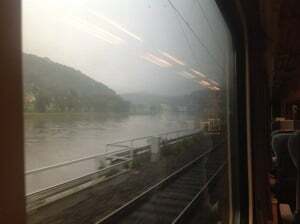 We left Charleville- Meziere at 8am and the first place we had to change trains was in Metz-ville in France followed by another train change in Luxemburg which is the capital city of the tiny country of Luxembourg. 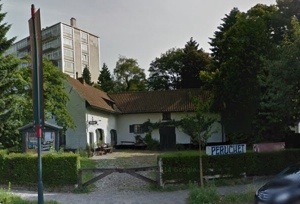 It was then a short journey of 2 hours to Brussels. The high speed trains in Europe have lots of really great features on board. Every seat has a power outlet so you can recharge devices like iPads and phones and several trains have either a restaurant car or serve food and drinks at your seat. The first place we visited in Brussels was Peruchet Puppet Museum. 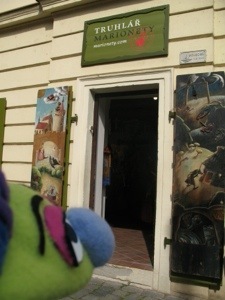 This museum contains the largest private collection of puppets from around the world and Miss Hannaford was really interested in the collection as it gave her an idea of how much space she will need if she keeps collecting puppets. 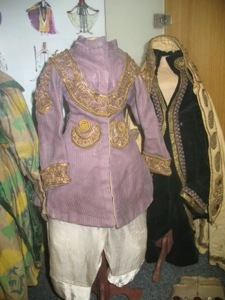 The Peruchet collection is over 4000 puppets and some of the puppets are over 200 years old! Dimtiri, the owner of Peruchet even signed a copy of his book about the Peruchet collection to Miss Hannaford. 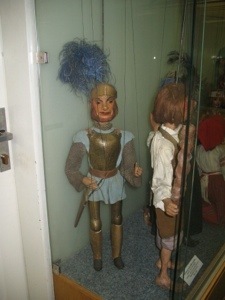 Unfortunately, there were no puppets in the Peruchet collection that look like me. 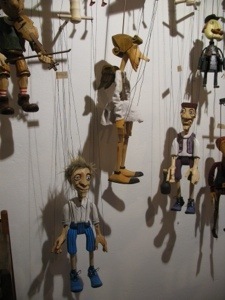 Most of the puppets are marionettes. 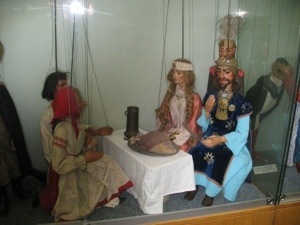 Here is a video about Peruchet Puppet Museum- even though Dimitri is speaking in French- you can see some of the puppets we saw and how they are displayed in the Museum. 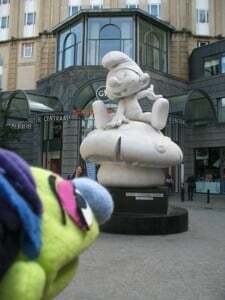 After the puppet museum, we caught the Tram back to the centre of Brussels as Miss Hannaford had heard that there was a giant Smurf statue outside a quirky museum called MOOF! 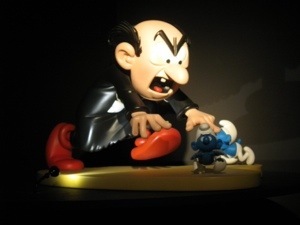 Did you know that the Smurfs originally came from Belgium? 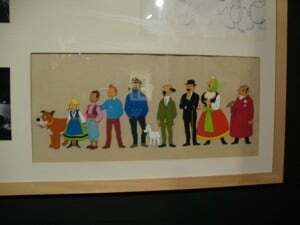 They were created by comic book artist Peyo (pen name of Pierre Culliford) in 1958. 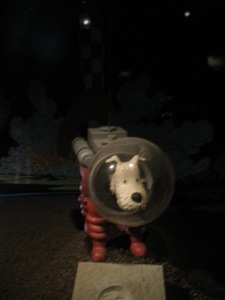 Other famous comic book series from Belgium that we know include Asterix written by by René Goscinny and illustrated by Albert Uderzo and Tintin by Hergé! The museum MOOF! 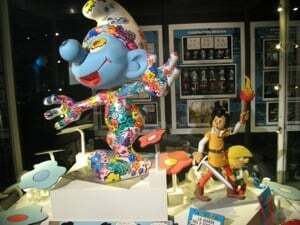 actually stands for the Museum of Original Figurines and is a museum devoted to figurines of all sizes of Smurfs, Asterix and Tintin! It is really interesting to see how all three comic book characters have similar designs and features. 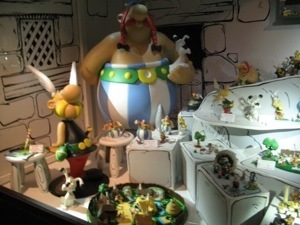 Miss Hannaford noted how the shows of Asterix characters are similar in style to the shoes of Smurfs! 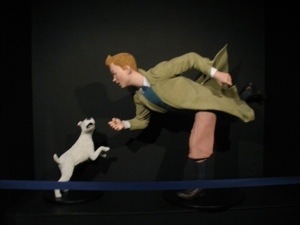 Also on display were original animation cells from Tintin showing how foreground elements and characters were painted separately from the backgrounds when creating an animation! It was a really quirky way to end our visit in Brussels! Tomorrow we travel to our last city on this tour- Prague! 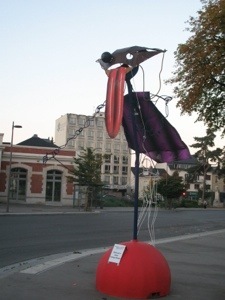 Today, Miss Hannaford and I visited a very important centre of Puppetry- the Institut Internationale de la Marionette which in English is the International Institute of Puppetry. 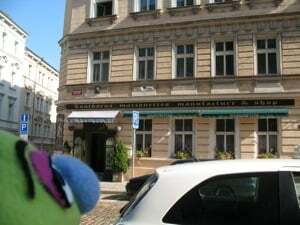 It is in this building that Miss Hannaford’s Puppetry teacher Marie- Martine Ferrari learnt to make foam Muppets in 1987 from Jim Henson who actually invented Muppets and Kermit the Frog. 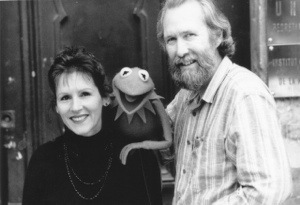 Since Miss Hannaford is a member of UNIMA- the international association of puppetry, she was allowed to access the huge Library of puppet videos and books and she found several videos that showed her puppet teacher rehearsing several performances as part of the workshop held by Jim Henson. 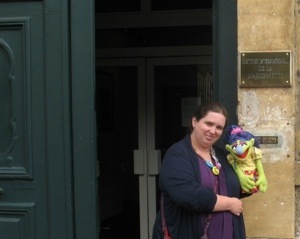 After spending a few hours watching all the videos in the puppetry archive, Miss Hannaford and I were given a special treat- the opportunity to have our photo taken in the same place as Miss Hannaford’s teacher, Kermit the Frog and Jim Henson had their photo taken. It really meant a great deal to Miss Hannaford to have her photo taken there. While we were at the Puppetry Insitute, we got to see the Great Puppeteer clock ‘perform’ twice. 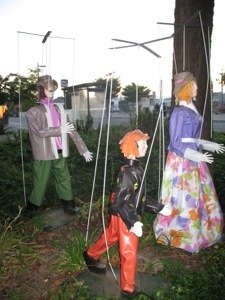 Once an hour, starting at 10am, the Great Puppeteer puts on a short marionette puppet show. 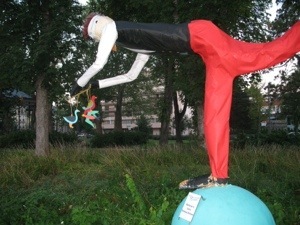 Each hour is a different performance and during the hour, the head moves slightly to show the Great Puppeteer is watching what is happening in the square below. 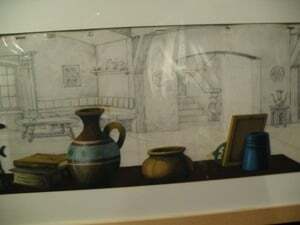 The story is based on a local Ardennes legend – The Four sons of Aymon – in a series of 12 scenes. 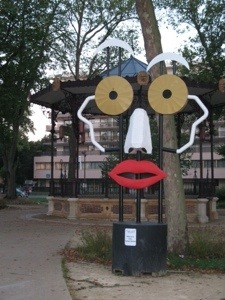 Being the centre of puppetry in the whole world, Charleville Meziere even has lots of sculptures in the local park of different kinds of puppets. 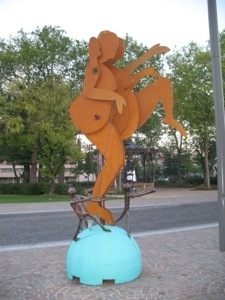 All of the sculptures are human sized or larger! It has been a wonderful visit and tomorrow we head off to our next country! 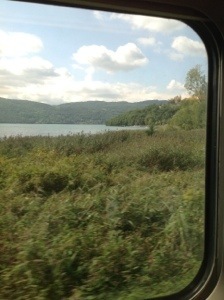 Today was the big train journey from Rome, Italy to Charleville Meziere, France. We left the hotel at 5am because the train left Rome at 6am so it is important that you get to the station with plenty of time so you can check which platform you have to get to and get your luggage onto the train. 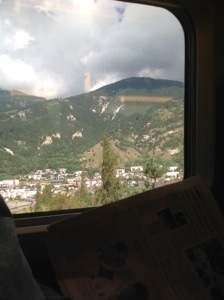 It was then a 4 hour train trip to Torino (Turin) where we changed trains for the TGV to Paris! 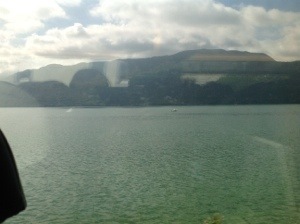 The trip to Paris was eight hours long and the scenery was wonderful with really big mountains! 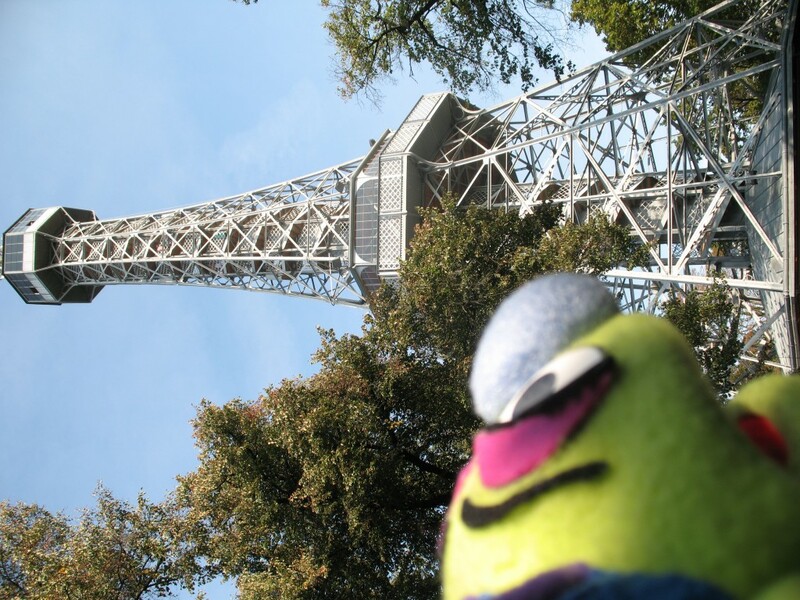 Once we got to Paris, not only did we have to change trains but we also had to change stations too! Fortunately Miss Hannaford arranged for a taxi to meet us as we got off the train to drive us and the luggage across Paris to other station so that we arrived with plenty of time for our train. The next stop was less than an hour away at Reims but we only had a few minutes to change trains at Reims to get the train to Charleville Meziere. It was a very long but interesting day. Travelling from Rome to Charleville Meziere took the same amount of time that flying by plane from Sydney to Los Angles did at the start of this huge adventure! 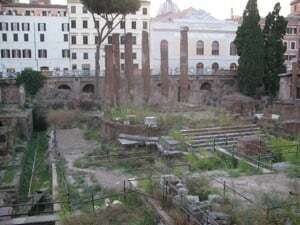 Today we went out to explore more of the ruins of Ancient Rome. 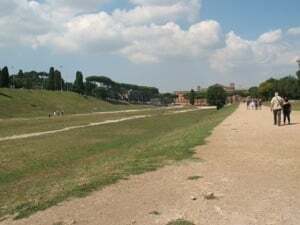 First we caught the underground railway called Metro from Roma Termini to Circo Massimo known in English as Circus Maximus. 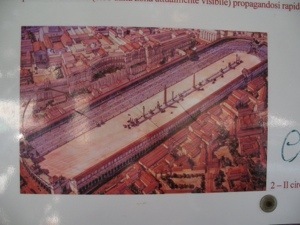 The Circus was where the great chariot races were held in a huge oval arena. All that is left of the arena now is a few walls where people sat to watch the race and the huge empty pit where the race was held. 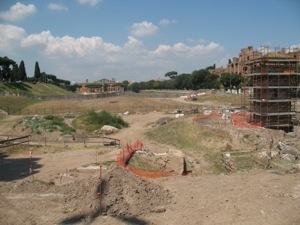 Here is a picture of what Circus Maximus would have looked like. 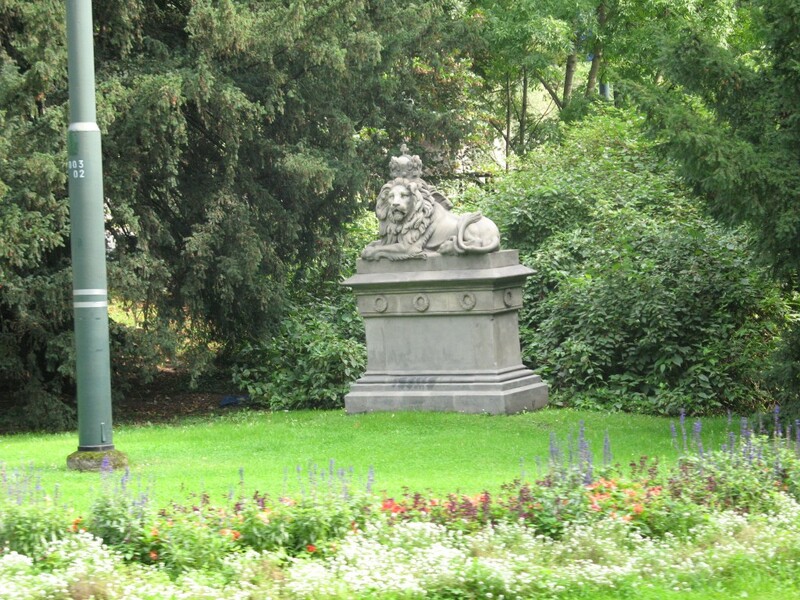 The chariot races were held as a form of entertainment in Rome. Each chariot was pulled by 4 horses and it was very dangerous. Most Romans went to the chariot race to either bet on a chariot much like people do today by betting on race horses or to watch the crashes. This video clip is of a very famous Hollywood movie called Ben Hur which recreated the chariot race. 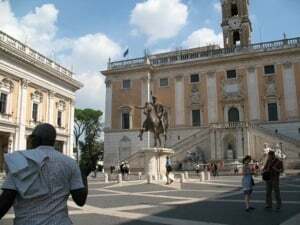 After visiting Circo Massimo, we walked to the bottom of the Capitoline Hill and then climbed the steep stairs to the top as Miss Hannaford wanted to visit the Capitoline Museum as part of the research she was working on in England. 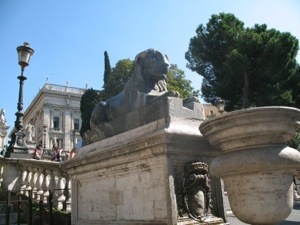 Unfortunately, once we got to the top of the hill, we discovered that the museum was closed on Mondays but Miss Hannaford did know that at the bottom of the Capitoline Steps were replica bronze Lions of the original Capitoline Lions she wanted to see. After eating afternoon tea in the park near the Altar of the Fatherland- we met our tour guide at Trajan’s Column for an evening tour of Rome. Our first stop was Teatro di Marcello- The Theatre of Marcello because it looks just like the Colosseum. 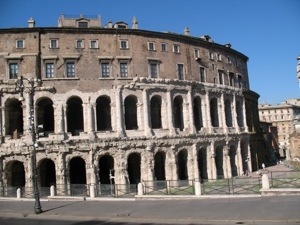 The reason it looks the same is that the design of the Colosseum was based on the design of Theatre of Marcello. 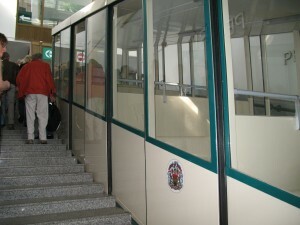 You will see modern windows at the top of the building because people actually live there now! The next stop was right next door at a church called San Nicola in Carcere or Saint Nicholas in Prison. 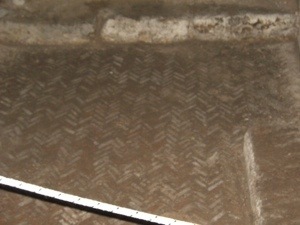 The reason we visited this church is that underneath it, you can actually see a real Ancient Roman pavement, and the space where shops used to be. 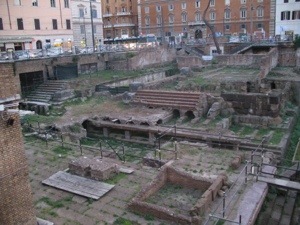 Ancient Rome is approximately 7 meters under the Rome we can see. It was really interesting to walk where Ancient Roman people walked over 2000 years ago. 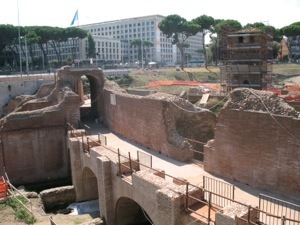 We then walked to Area Sacra which is where the ruins of Pompey’s Theatre are because this is the place where Julius Caesar was assassinated on 15 March 44BC. Miss Hannaford has always been interested in Julius Caesar so it was a great treat to see where Julius had died on the Ides of March. My favourite stop of the day was to see a sculpture of an elephant with an Egyptian obelisk on its back. 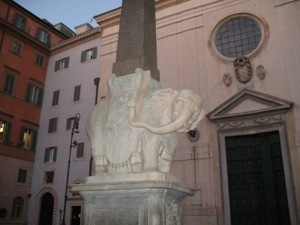 The tour guide told a very funny story about how the Chief Engineer of Rome wanted to change the sculpture and he upset the artist Bernini so much with the changes that Bernini changed the trunk so that it made a rude gesture at the office of the chief engineer but also he turned the elephant around so that the engineer only ever saw the bottom of the elephant! 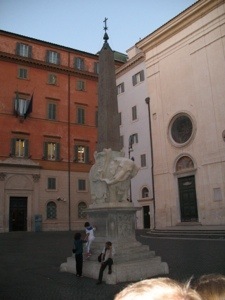 After the elephant sculpture we also visited the Pantheon and Piazza Navona but it was too dark to take any pictures. Today was really hot and humid in Rome. 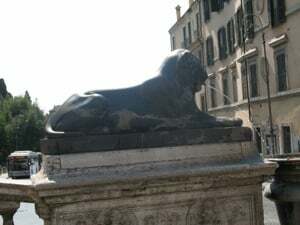 We did catch a bus from our hotel across the River Tiber as Miss Hannaford wanted to find a puppet theatre she had read about but it was so hot we ended up buying a gelato and coming back to the airconditioning in the hotel. We spent the rest of the day getting organised and packed for the really big train trip tomorrow to Northern France.